Ca02 Hourdel, StP.Gruppe Cayeux, K.V.A. 'E1'. Picardy. 2 x R668 (at Ca39). 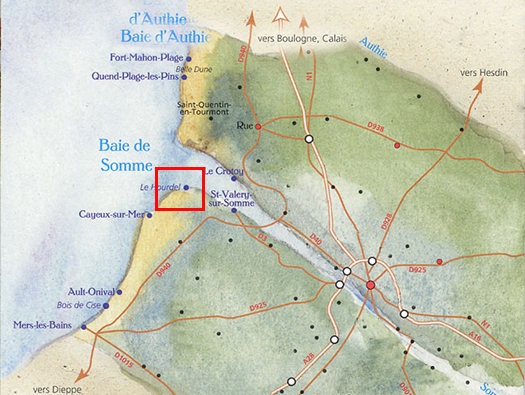 Ca02 was protecting the entrance to the River Somme estuary. 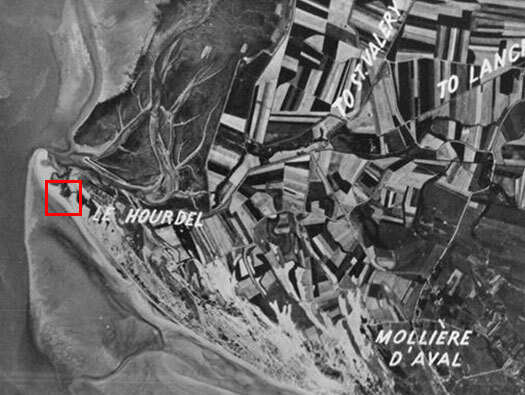 An allied reconnaissance photo 27 August 1942. R612 casemate for an 7.5cm Field Kannon 231(f) assault gun. The gun was a 7.5cm cannon taken out of a French arsenals after the capitulation. R612 casemate. This is the rear entrance for the gun to access the casemate. R612 two small ammunition niches each side of the back door and the gun room in the front. R612 casemate. The front view a quite small embrasure and a flanking wall to protect the gun from being fired at from the sea. How the flanking wall protects the guns embrasure. This could be an R600b of which there were two in Ca02. R600b either was a full bunker with crew room and ammunition room underneath and an open emplacement above or just the open emplacement without the rooms below. 5cm KwK 39 L/42 in a R600 emplacement. Crew on the left and ammunition on the right and an escape out of the crew room. R600b Emplacement for a 5cm KwK anti tank gun. The 5 cm KwK was an obsolete tank gun as the 7.5 & 8.8cm guns had by then taken over and in a ground role set on or in a casemate was an excellent gun and could knock out nearly any allied tank and also landing craft. 5cm KwK 39 L/42. note the leather muzzle cover hanging on the barrel.